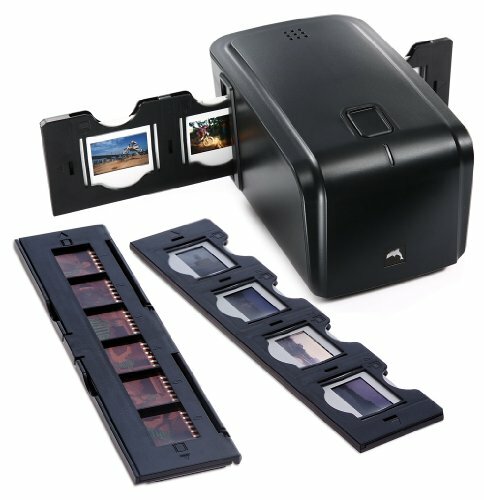 The Memor-ease PLUS is an affordable and simple way to quickly digitize all your 35mm negatives and mounted slides. The PLUS is Magic Touch, a powerful technology that is engaged with a touch of a button to detect and eliminate dust, scratches and other flaws, restoring your image to its original beauty. Magic Touch works seamlessly with the scanning process to ensure that you get the best possible image quality. With a scan speed of approximately 9.5 seconds and a resolution of 1800dpi, the Memor-ease quickly creates high-quality digital files that can be stored to hard disk, CD-R, or DVD-R for archiving, on-line sharing and re-printing. The Memor-ease includes USB 2.0 connectivity, compatibility with Windows XP and Vista operating systems, and includes the award winning Adobe Photoshop Elements 5.0 software for editing, printing, and generating slide shows. It also includes Cyberview CS, Pacific Image's proprietary scanning software, which includes an image adjustment tool that allows users to select color variations from nine settings and view the changes in real-time.- Converts 35mm slides and negatives into digital format. With a conversion speed of approximately 9.5 seconds you can turn your stacks of film strips and slides into digital format in no time. -Easy to use...as simple as taking a digital photo. -Equipped with a high-resolution 5MP CMOS sensor, together with Pacific Image's proprietary uniformity, color balancing and conversion algorithms, Memor-ease creates high-quality images of 1800 dpi from your negatives and slides. -Real-time preview of negative film in full color. If you have any questions about this product by Pacific Image Electronics, contact us by completing and submitting the form below. If you are looking for a specif part number, please include it with your message.